Olivia Petersen thought her life ended the day her husband walked out. Little did she know, it had only just begun. Swept from her perfect paper-doll life in Houston, Olivia finds herself in Chicago, alone, betrayed, and far from home. Soon everything she thought she knew about herself and her life will be challenged. Ash Harper is the man who has everything--everything except healing from the losses of a lifetime and a dark family secret. Out of the Box Awakening is a women's seasoned contemporary romance about second chances, shared passion and shared joy. 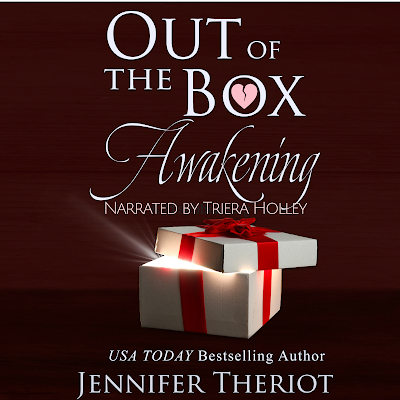 Jennifer Theriot has written a compelling series about what happens when two people over the age of forty find new life and new love for themselves. Recommended for readers over the age of 18. This book contains adult language and situations. I started narrating audiobooks a year ago in 2016. I own an online book rental company and I did a small voice over bit for a marketing piece. A lot of friends said I really ought to look into doing voice over work. So I started out reading recipe books until I understood what works and what doesn’t work, how best to improve the sound, how much I could speak before my voice ran out, and how best to use the software. Once I felt comfortable navigating all these factors that go into audiobook recordings, I started narrating children’s stories. I can’t say I have one favorite genre over another. I quite enjoy reading children’s books because you can vocally explore a wide range of voices (many silly voices which are fun). I enjoy adult fiction that fall under first person romance or thriller, because I can delve into the character’s emotions and it taps into my theatrical side. Do you like input from your authors as far as voice styles or photos of the muses for characters? And is that helpful to you as a narrator? I find voice samples and photos are extremely helpful in knowing what the author saw when they wrote the book. It is especially helpful for long stories with many characters. This helps delineate the characters from one another if you know the actors in real life. The downside can be if you don’t recognize the actor or their character type, then it becomes a concern whether or not you are adequately representing the character as the author intended. So, you got the audition request for Out of the Box Awakening. What made you accept it? Was there something about the story line or character that drew you in? From the very first paragraph of Out of the Box Awakening, I was drawn to Olivia. There was a wonderful vulnerable quality to her. Jennifer Theriot did such an amazing job of capturing her inner voice, that I knew I wanted to be the voice for Olivia. I also read a lot of the reviews from people that purchased Jennifer’s books and there were some amazing reviews that I knew this would be a book I would not only enjoy narrating, but reading. For a long book (it was estimated at 15 hours), it was important it was a book I would enjoy reading, and I was not wrong it was an incredible story. Did you have a favorite character in Out of the Box Awakening? Aside from Olivia, Todd is hands down my favorite character. I love the breadth of his character from unapologetic bad boy to hopeless romantic. I enjoyed narrating his lines when he would both swear like a sailor whilst at the same time espousing the merits of love, friendship, and kindness. Is communication with your authors important along the way? Communication with the author along the way is an absolute necessity. Yes, I can narrate a book without any input, but it would be terrible to find at the end that you didn’t get the character as the author intended. What I really enjoyed about working with Jennifer was how easy it was to develop a bond with her, even though we live on opposite sides of the planet. From the start, I knew I would like Jennifer and I immediately felt an obligation to do her story justice. I also felt her supporting and cheering me on as we advanced through the chapters. When you have an author that is excited for the narrator and appreciates the work, it makes it so much more rewarding! You’ve received some pretty high accolades from Jennifer Theriot. How does that make you feel about doing future projects with her? 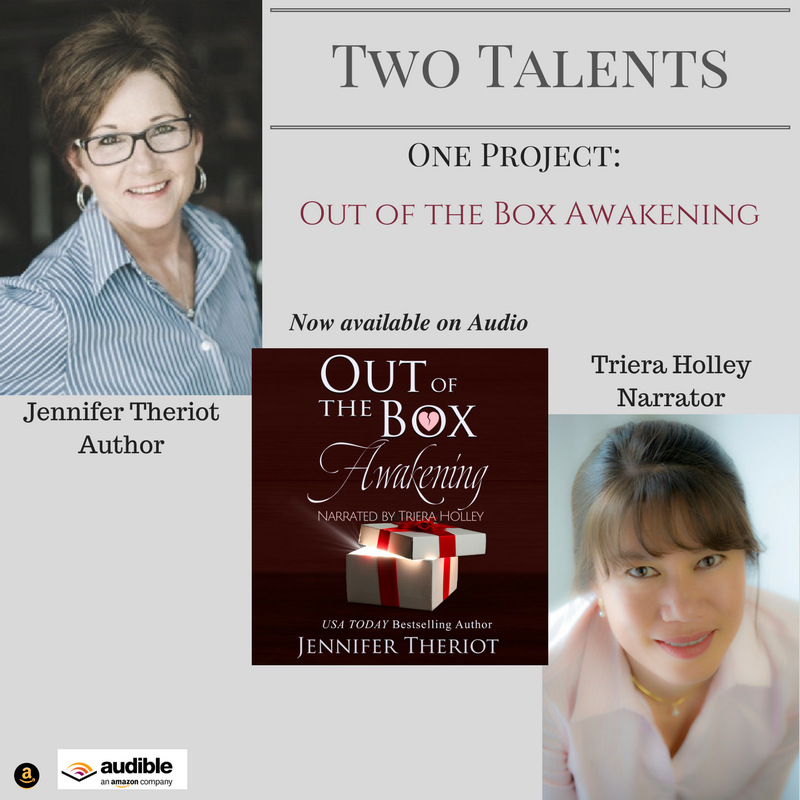 Would you consider doing any more books in her Out of the Box series? Using one of Olivia’s favorite sayings- “without a doubt”. I would jump at the opportunity to work with Jennifer again. Once I started narrating the final chapters of Awakenings, I felt both thrilled and melancholy to be finishing her story. Not just because the story was ending, but also because it has been such a breath of fresh air working with an author that cares so much for her story, for her narrator, and for the overall experience. I could tell that this story was more than just an endeavor for her. It is a story that lies close to her heart. Now, a few questions for Triera as a ‘person’…. Outside of narration, I actually wear a few hats. I own an online book rental company in Denmark. I started it when I first moved here and started my little family. Books and most consumer goods in Denmark are expensive. There is a large second hand market here for that very reason. I was always an avid reader; as a child I was the first one running out to the book mobile. I saw that both my children held this same joy for books, but our libraries only carried about 30 English books. Whilst they would learn Danish and primarily speak Danish, I wanted to read to them and I wanted them to learn English. So I started owlbooks.dk for other expats that found themselves in the same situation. I also do post production work. My clients are primarily professionals (no Hollywood movies yet). Most of the productions are online projects from commercials, to youtube video logs, coaching and strategy projects. These are a lot of fun and I enjoy the diversity of the projects. I have had the pleasure of narrating nine titles. My repertoire entails cook books, children and young adult books, and adult fiction. I’ve been a child, a witch, a vampire, a celestial being, and an amazing woman by the name of Olivia. Aside from playing the piano, I love sitting in front of the computer learning new things around the creative digital space. These are the two hobbies that I do on a regular basis, but I’ve delved into so many hobbies and as part of my quest to experience life to the fullest I hope to never stop taking on new hobbies. Many years ago I started taking flying lessons where I got to fly Cessna aircrafts. I was nearly complete with obtaining my private pilot’s license when I wound up moving and no longer lived close enough to my flying club. That was such a thrill and I do hope to take up lessons again. What does the future hold for Triera? If my history has taught me anything, it’s that there is no telling what my future holds. The beginning never follows a finite line to the end. I started off in this life as an orphan from the ravages of war and I was adopted into a wonderful family of six, worked and traveled throughout the world, and wound up in Denmark as a mother of two angels sent from heaven. I can only hope that my future holds wonderful experiences surrounded by people that I love and care for.